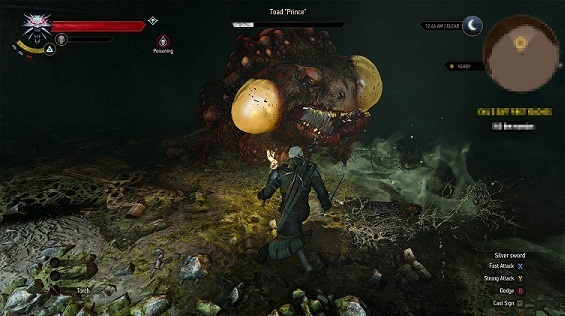 As the first Quest in the The Witcher 3 expansion Hearts of Stone sends you "Evil's Soft First Touches" in the sewers under Oxenfurt where the horror version of the Frog Prince has taken root. This has already devoured many women who went to him in search for love. We show you how you defeat the fat prince, toad. - Northern Wind Bomb: Even if the toad seems sluggish, you can jump around wildly. The Northern Wind Bomb causes freeze effect, which slows him down. - Golden Oriole: The Toad Prince has ranging attack that will poison you. Take Golden Oriole Drink before the potion, you are already immune. Antidote also helps the new equipment of Viper school. - Cursed oil: For more harm - apply previously cursed oil to your silver sword before you use it. - Yrden: You can also slow down and capture The Witcher character, you can take him down with a several blows of the sword. With Toad, you will certainly have problems. Generally, you should always keep moving and not stand still in front of him. As he uses extremely long tongue and fling toxic on you. It is better to reach him from the side or from his back. After a few blows it will jump regularly in the air around you to hurt with a ramming attack. This throws you a few meters back and makes you dizzy for a few seconds. So back in time before this attack.